Beauty by Kristin | A beauty blog. Make-up lovers unite! July 9, 2011 New New location! Beauty by Kristin has moved to a new place, we got our own domain! BeautybyKristin.com! June 21, 2011 VIDEO: A few beauty items for less than $5! I recorded this using my Blackberry but the quality seems good. Also I sound like a man LOL not sure what the deal is there, must have been trying to keep my voice down? Anyway it was my first video and I hope to do more, let me know what you think! I came across this amazing lip balm awhile ago and decided I should do a post about them already! 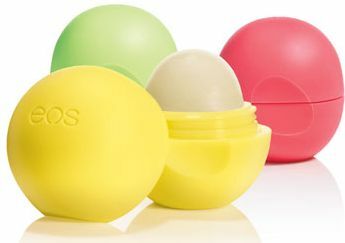 EOS – Evolution of Smooth, makes body lotions, shave cream and these cute and effective lip products! They look a little different then conventional chapsticks, and are too cute! They are gluten, paraben and petroleum free! Not only so they look cute and do wonders for your lips, they smell yummy as well. I recommend picking one up (or two!) and trying them. I promise you’ll fall in love too! This toner is SUPER easy to make, as well as cheap to make! Witch hazel is a great toner for the skin and the aspirin helps to clear acne and even out skin tone! Pour 1- 1.5 cups of witch hazel into your container. Shake well and wait for the aspirin to dissolve. Be sure to shake before each use. Just apply to a cotton pad and rub all over face, avoiding the eye area. I recently picked up this new polish from OPI. When applied over an already dry polish it cracks to create a “shattered” look. I thought it looked really neat and I wanted to try it. Overall I’m very impressed and I like it a lot! You definitely need to apply a top coat though, because the Shatter polish is fairly matte. Easy to do and what an awesome effect! I think it cost me about $12 and so worth it! I recently saw a few videos on Youtube about this and I thought I would share my thoughts. Skin needs nourishing. I need anti-oxidants, vitamins, minerals and love. However be careful how many products you layer onto your face. Too many products and your skin will become overloaded! Here are the products/routine I use at night and before I go to bed. First, I remove my make-up using Clarins make-up remover (Or Ponds cold cream) and either a washcloth or damp baby wipes. Next I cleanse my face with a Tea tree cleanser. Rinsing well. Next I use Arbonne’s RE9 Regenerating toner. This is one of my favorite toners! It’s full of vitamins A, C, E and more anti-oxidant rich ingredients. It’s also pH-balanced. After that I use the RE9 Intensive Renewal serum and sometimes add a drop of tea tree oil and/or vitamin E.
Last but not least, eye cream! Under the eyes and around the orbital bone. Prevent and treat those wrinkles and delicate eye area! Other than that you don’t need to pack on more moisture unless you have very dry skin. Also note that this is a nighttime routine. I wouldn’t do this in the morning or during the day. Strictly before bed. I’ll post a day-time skin routine in the future. A beauty blog with reviews, DIY beauty products, raves/rants, giveaways, even fashion topics! July 9, 2011 New location! April 28, 2011 Have you read your ingredients?